Yesterday morning someone stole one of our debit card numbers and tried to run up over $850 in charges on our PayPal account. Imagine my surprise to find messages from PayPal in my email with all these charges! Especially since I knew the charges weren’t mine. The card they were made on was my husband’s, and he was at work, not running up charges online. Here are all the charges as they show on our PayPal account. Not sure why some appear more than once. PayPal is often a mystery to me. So after the shock wore off and I could think straight, I called our bank. The PayPal account is backed up by our checking account. Since the first transaction wiped out the $94 balance I had in PayPal, all the charges should have gone directly to our bank. Yet none of the charges had come through, they weren’t even pending. Immediately I severed the link between the bank and PayPal. Then I called PayPal and very quickly was connected with a helpful and sympathetic customer service person who canceled the card and the transactions. They restored my $94 balance. Phew! Disaster averted, we hope. Now comes the interesting part. It just happens that my husband, Tim, never uses his PayPal debit card. It’s been resting comfortably in his wallet for months. For Christmas someone gave us a cash gift through PayPal. On Monday, Tim decided to use the card at the local gas station. He bought gasoline at the pump and also went in the store to pay for diesel for our tractor. It surely is a lovely gift to have someone buy fuel for us! We were very grateful. We realized that since this card has not been used anywhere else, it may be possible to find the thief! I called the local police today. The gas pump receipt even gives the number of the pump used. The police officer suspects someone placed a skimmer on the pump to steal credit card information. Generally, people use their credit cards all over and it is hard to figure out where a theft occurred. Luckily, Tim didn’t use his card anywhere else and we can pinpoint the theft to the gas station. The police officer checked the gas pump and talked to the store owner. There was no skimmer evident today. But the card information was swiped Monday and the thefts happened yesterday. Plenty of time for the thief to remove the evidence. Tim said he didn’t see anything unusual about the card reader when he paid at the pump. You insert the card into the pump to pay, there is nothing sticking out. I’m not sure how the skimmer would work. Maybe it just has to be in the proximity? Tim’s debit card is the old kind without a chip, so I’m not sure how this skimming could have happened. 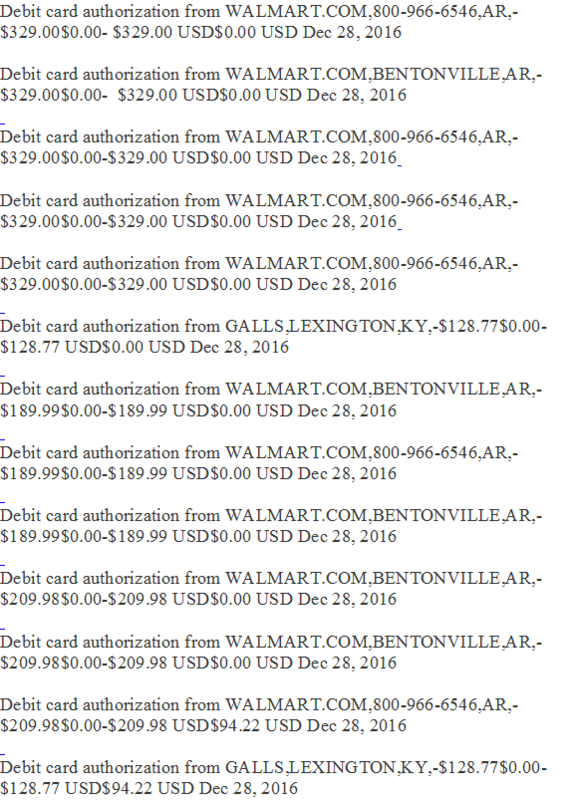 Now the police are going to subpoena the Galls and WalMart transaction records to try and find the individual who ran the charges. The thefts were likely made online. How this scam could work, I don’t know. If you make an online purchase, the merchandise is not shipped until the charges clear and the items have to be sent to an address. If the transaction is canceled, the item never ships. Perhaps the thief hopes the activity won’t be caught until after shipment. If only people spent their energy getting and holding jobs instead of finding ways to rip others off. Then they would have legitimate money of their own to spend. I think the dogs are saying thanks for the thick, soft new bed, Mom! It keeps us warm on chilly nights. 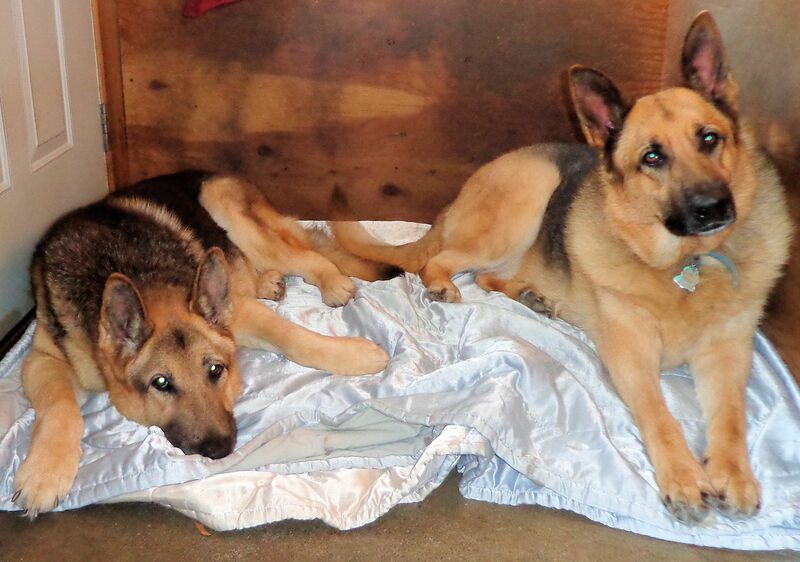 Holly, on the left, and Otto will enjoy this old comforter to death. I’m hoping it will last a month before it is tattered and stained. They are large, active dogs. Holly is seven and Otto is five. These farm dogs range all over our acres, peacefully co-existing with chickens, rabbits and horses, swimming in our small river and following me when I go horseback riding. Somewhere along, Holly picked up a tick that transmitted Lyme disease to her. Even though we use Frontline every month to kill ticks and give the Lyme vaccination annually, she still got the illness. That’s because Frontline takes several days to kill ticks once they get on a dog. During that time, a nymph tick can transmit the Lyme bacteria into the dog’s blood. Because there are several types of Lyme and the vaccine does not protect for all of them, it is likely Holly contracted a version that the vaccine couldn’t touch. She started to go downhill very slowly. Her appetite was not so great. She left food where she once gulped it down. At first we thought it was good because she was over-weight and we were trying to get her to lose weight. But we should have realized her lack of appetite was a problem. She kept losing weight until one day I noticed that the bones on the top of her skull were protruding. She also was weak in the hind end and occasionally brought food up. The symptoms were intermittent. Sometimes she ate and acted normally. I suspected the medication she takes to combat her leaking bladder was causing her to be anorexic. It can have that effect on a small percentage of dogs. In August we took her to the vet and discussed what could be wrong. She had normal vital signs. We talked about various diseases like myasthenia gravis, to which we had lost one German Shepherd in the past, and other wasting illnesses. We went home with some pain medication and a different drug for the leaky bladder. The doctor wanted to see if her lameness in the hind end would improve and perhaps her appetite. By early October it was apparent that she was just getting worse and worse. Her food often came back up, undigested. I finally figured out that she was not swallowing it. This can be a symptom of myasthenia gravis. The dog will develop megaesophagus due to muscle weakness and inability to swallow. The food sits in the esophagus which gets large, loose and flabby. The dog will cough food back up. We also noticed that Holly no longer held her head up, she walked around with her head hanging. Her tail no longer had the characteristic curl at the tip. She dragged her tail along the floor. Frequently she would stumble on her left front foot. Her voice had also changed to a high-pitched yip instead of the deep Shepherd bark. It seemed she had muscle paralysis. Back we went to the vet. We told him all the new symptoms. This time when he checked her vital signs, she had a fever elevated about two degrees. So he tested her for Lyme disease and she came back positive. He did a barium x-ray and diagnosed megaesophagus. You could see the food just sitting in her throat instead of going into her stomach. Thus started a month-long dosing of antibiotics. I designed a stand for Holly to place her front feet on when she ate so her front end could be elevated at 45 degrees. This would help the food go down her throat. Her food was soaked in water and we added canned dog food as well. Everything had to be mashed to make it slide down easier. The first few days were hard going. Getting food and medicine down her throat was difficult, but I kept at it. Finally she began to swallow again. Over time she learned to get up on her stool by herself when it was mealtime. Less and less food came back up. By the end of the month of antibiotics, Holly had energy again. The spark had returned to her eyes. She carried her head normally and her tail got the curl back. We went to the vet for a recheck and were surprised to learn she had actually lost weight. The vet suggested feeding puppy food since it has higher protein. I had been giving her an egg a day and that was upped to two. After a week or so we noticed that the area at the top of her skull seemed to be filling back in. She started looking less gaunt. Holly was able to eat her soaked dog food whole instead of having it mashed. I began adding in dry food so she could do some chewing to help develop the atrophied muscles of her jaw. She seemed on the road to recovery. Then she started regurgitating again. At first we hoped it was a fluke, but no. After a couple more episodes, we opted to put Holly back on another month of antibiotics. Sometimes it takes more than one course of medication to eliminate the disease. Lyme bacteria live in the spaces between the cells of the body. It is harder for the immune system to attack and remove them. Antibiotics also do not permeate so well outside the cells. Holly has been on the second course of medication for about a week. Her food mostly stays down. She has energy and appears to be gaining weight. We have high hopes that Lyme disease is her only problem and there is no underlying issue. We will know at the end of this bottle of antibiotics if she truly is improving. I have learned that the dogs of neighbors on both sides of us also had Lyme disease. Our woods are full of deer and fields are home to deer mice. Both these species act as hosts for the deer tick that carries Lyme disease. My husband and I pull ticks off ourselves, especially in the spring. This horrible disease is all around us. We take the precautions available, but sadly there is no 100% method to avoid tick exposure (besides staying in the house!) We live on a farm and love to walk in the fields, orchards and woods. We also have to work in those places to keep the farm running. We can’t hide in the house. Recently there seems to be increased interest and awareness in the medical community about Lyme disease. I have personally witnessed the ravages of this illness in people who went undiagnosed for too long. The bacteria were able to set up deep in the body and wreak havoc. The experience with Holly has taught me to take any change in health very seriously. Even if the symptoms are not typical signs of Lyme disease, the infection should be a first consideration as a culprit so treatment can begin as soon as possible. We have our fingers crossed for Holly. She is still a fairly young dog and should be able to enjoy several more happy years, if we can just beat this awful disease. On this eve of the Winter Solstice, as I gaze at my newly erected Christmas tree, I consider the origins of some of the traditions that surround this time of the year. 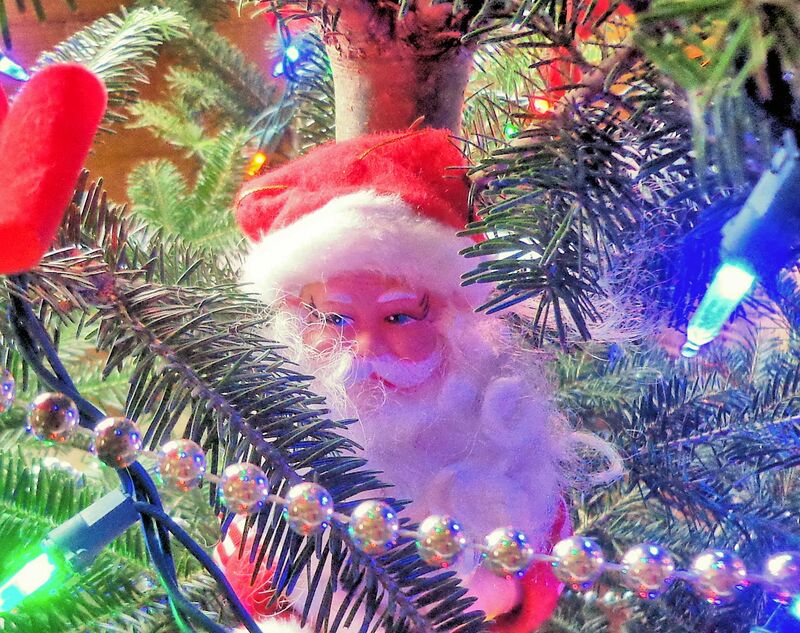 For instance, the little elf-like Santa peeking from among the branches of the balsam is tied to the legend of Santa Claus and to the tradition of elves. Many of our Christmas customs come from Europe, especially Scandinavia and Germany, although Italy also has a strong influence. Most traditions pre-date Christianity. Santa Claus harkens back to the Nordic belief in Odin, the bearded father of the gods, who had a sled pulled by his eight-legged horse, Sleipner, and who rode through the night during the time of the mid-winter festival bringing gifts of food to the needy. Odin was also called Old Man Winter. Dressed in a hooded fur coat and riding a giant white horse, he would visit homes during the festivities bearing gifts and good cheer. Yule, which meant feast, was the name of the winter solstice festival. It is easy to see why our modern Christmastime involves feasting and presents. Children would put hay, candy and carrots in their footwear drying by the fireplace as treats to tempt Sleipner to stop so Odin would leave gifts. This practice evolved into hanging stockings on the mantle to be filled with gifts. Sleipner’s freakish eight legs changed over time into eight reindeer pulling a sleigh. German and Italian folklore tells of good witches who rode brooms through the night during the mid-winter festival, stopping at each home to leave gifts for children. The good witches represent the notion that women symbolize birth, the gift of life. Thor and Saturn were also associated with the mid-winter time. Thor, who rode a wagon pulled by two goats, aided the maiden sun goddess to escape from darkness. At the solstice, people dressed as goats and went from house to house singing and acting out simple plays in exchange for food and drink. The activity evolved into caroling. In Scandinavia, a Yule goat is still part of Christmas. The gradual loss of sunlight that occurs in the northern hemisphere led to many rites aimed at appeasing the gods and bringing back the sun. The time was associated with death and rebirth. Saturn, Roman god of the sun, was celebrated with Saturnalia during the shortened days. Everywhere, people observed the vegetation die in the fall, and the Earth hibernate through the long, cold “death” of winter to be reborn with the greening of spring. The idea that capricious gods could interfere with the process led to the need to appease and entreat, as did a requirement to support the gods associated with the sun and life. With the coming of winter, excess livestock was slaughtered to save on fodder and provide meals. The surplus of fresh meat encouraged feasting. Some of this livestock sacrifice was dedicated to the gods to please them in an effort to ward off bad luck, evil, sickness and the dark. Blood was a potent symbol of the sacrifice. The red of blood paired with green provides our traditional Christmas season colors. Green is strongly identified with life and its presence in the stark winter landscape was significant. Evergreen trees, ivy and holly all symbolized the hope of lingering life holding on through the cold and dark, and new growth in the spring. 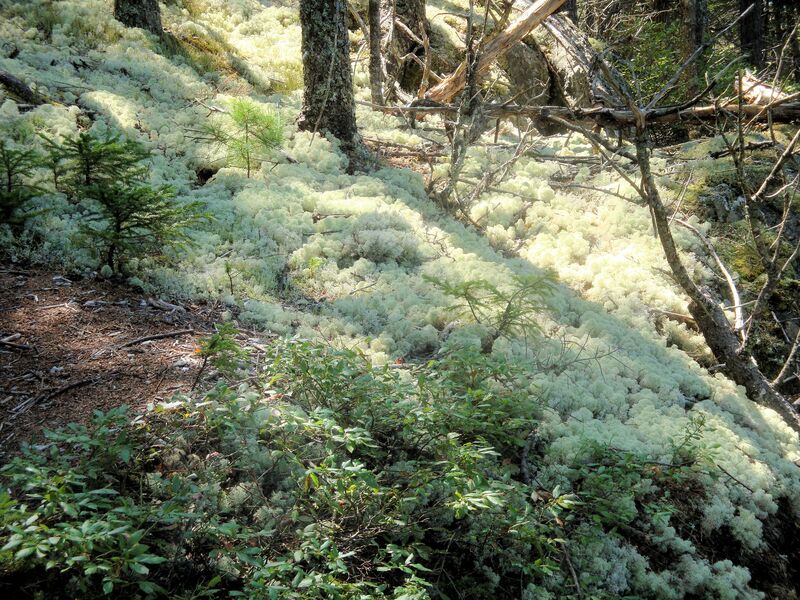 When people believed in the presence of spirits in plants, evergreen spirits were thought to be strong positive influences and wards against evil. These plants were used to decorate, especially over windows and doors where negative entities could enter. By bringing evergreens inside, people believed they brought good luck into the home. During the mid-winter festival time, Norse people would decorate evergreen trees with food, clothes and tiny replicas of the gods to entice the tree spirits to remain during the dark, cold winter or encourage their return in the spring. These beliefs carry on through Christmas trees and evergreen garlands. Cutting an entire large tree and bringing it into the house to burn during the winter solstice festival also was an exercise meant to carry luck to the home. The Yule log was lit from the remains of the previous year’s log. It burned over the entire festival season that extended from the shortest day of the year until January 12th. The unburned remains were carefully kept for next winter. The notion that the sun died and was reborn during the shortest days of the year inspired many practices. Rebirth was associated with women, just as the Norse and other cultures thought of the sun as a goddess. Each year she was carried away to the dark lands and devoured by the wolf who lived there. Yet, before she died she gave birth to a daughter, the new sun. The period from the solstice to Jan 12 was a tenuous time for the new-born sun. Her growth was supported with sacrifices and feasting. By the middle of January, as the days become noticeably longer, it was safe to assume that the new sun would live, the earth would warm again and green would return. To help inspire the young sun, wheels were built of sticks and evergreen boughs, lit on fire and rolled downhill. The burning circle represented the orb of the sun and also the circle of life. This was the inspiration for our modern wreaths. Just as the winter solstice is associated with rebirth, it also has strong connotations of death. The people of old believed the long, dark winter nights were the time when souls of the ancestors were able to return. They joined with other spirits on Earth and roamed the night, sometimes causing mischief or bringing bad luck or death, especially to those who had acted badly during the year. The ancestral spirits were associated with elves. The elf symbolized the soul. During mid-winter an abundance of elves could be expected. Offerings were left for the elves to make them happy so they would behave and not cause trouble. November 1st was once called the Elf Sacrifice, a time to provide valuable gifts to appease the ancestors as they began their time among the living. The Elf Sacrifice marked the beginning of the countdown to Yule. From these ancient beliefs comes the idea that Santa and the elves are watching children to see if they have been naughty or nice. Good children are rewarded and naughty ones are punished. So many layers of tradition over millenia have led to our modern Christmas customs. The ancient practice of giving gifts has evolved to the modern horror of commercialism. Before the turkey is even on the Thanksgiving table, merchants now begin their frenzied appeal to buy, buy, buy! The annual gift glut beneath the tree may be the end product of thousands of years of winter solstice celebrations, but it does not have to mark Christmas unless we let it be so. 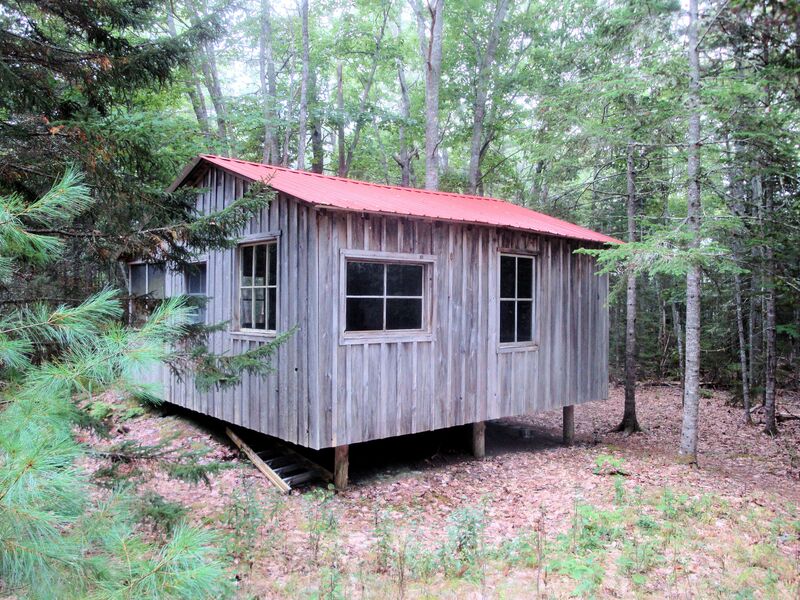 This past September my husband and I rented a primitive forest cabin and spent a weekend Down East exploring the Blue Hill region. 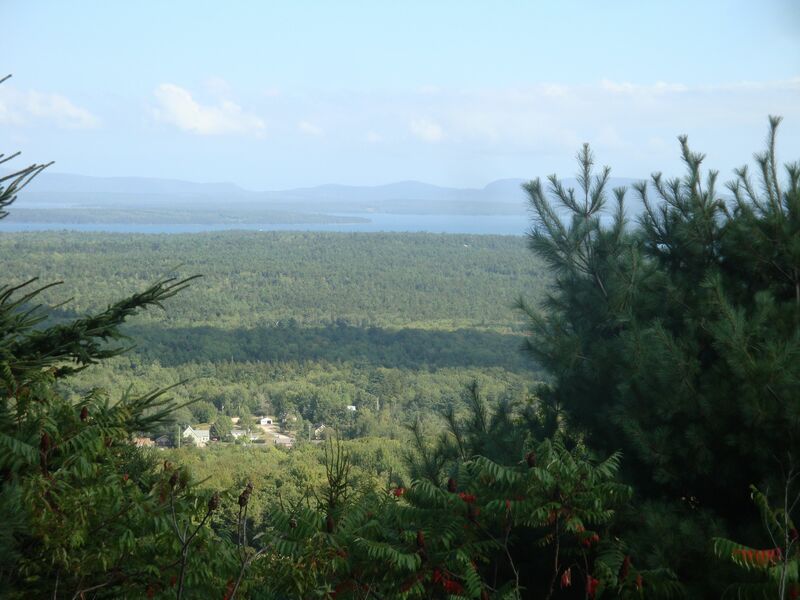 This area encompasses the small monadnock mountain of Blue Hill (elevation 934 ft) and the surrounding large peninsula jutting into the Atlantic sandwiched between Penobscot Bay and Mt. Desert Island. 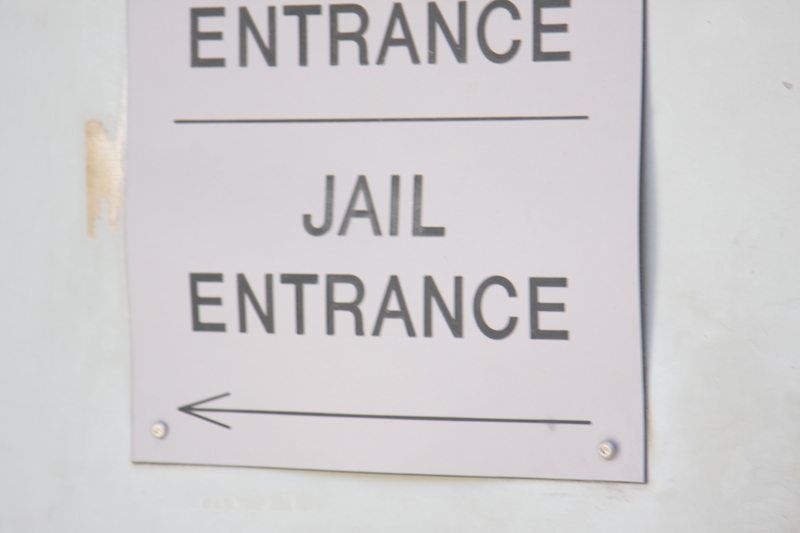 There are several small towns on this peninsula including Blue Hill, Surry and Castine. Crossing the impressive old bridge over Eggemoggin Reach takes you to Little Deer Isle and Deer Isle, two very beautiful islands, and the towns of Deer Isle and Stonington. There is also Cape Rosier, on the Castine side of the peninsula, where we stayed near the hamlet of Harborside. 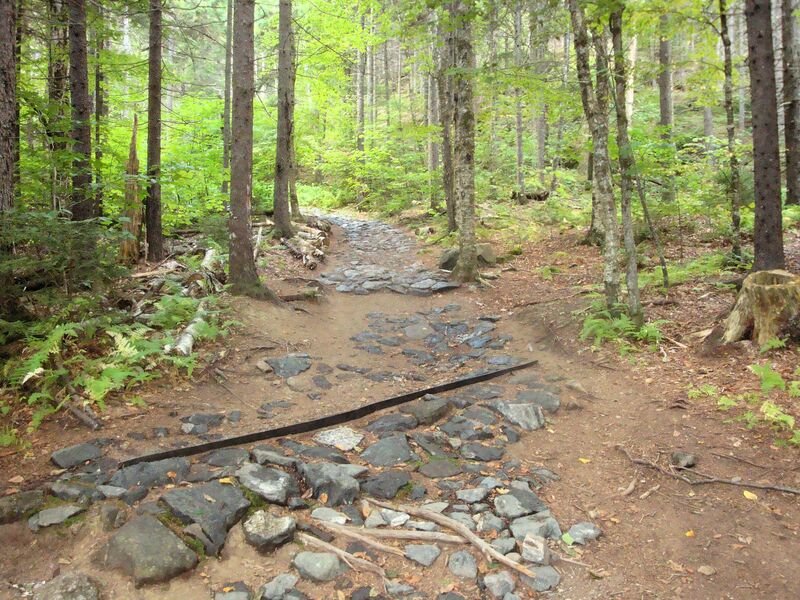 This part of Maine lies just off the major byways of Rtes 1 and 3 that each year carry millions of tourists to Acadia National Park and points farther east. The turn-off to the peninsula flashes by quickly at 65 mph. 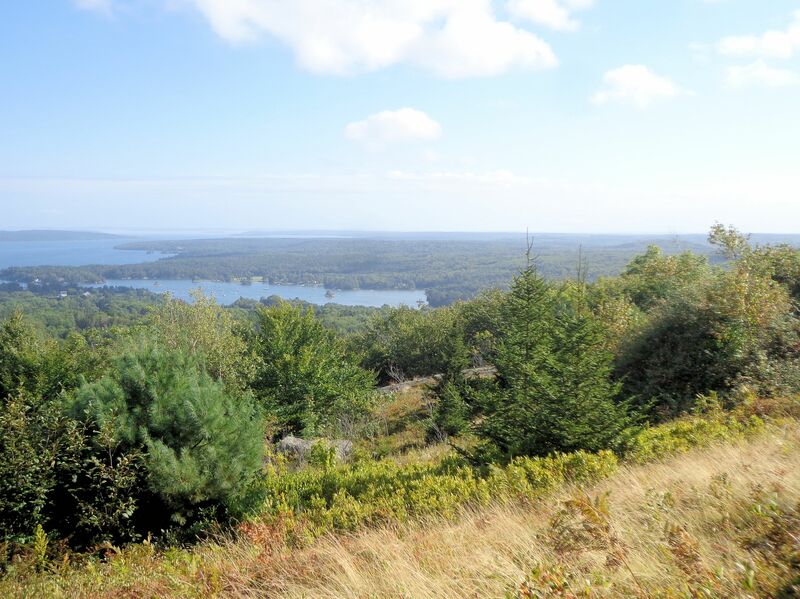 As a result, the area around Blue Hill remains more like the old-time country Maine increasingly vanishing from the Maine coast. So much of the seaside region has been taken over by the tourist trade with traffic, seafood restaurants, strip businesses, fast food, endless motels and big box stores. Mainers tend to avoid these congested areas, especially in summer. Maybe I shouldn’t even let people in on the quaint charm of the Blue Hill region for fear of development! Tim and I enjoy a roughing-it vacation occasionally. This cottage was not as rough as our usual tent accommodation. There was no cell phone signal, electricity or running water, yet we were quite cozy. 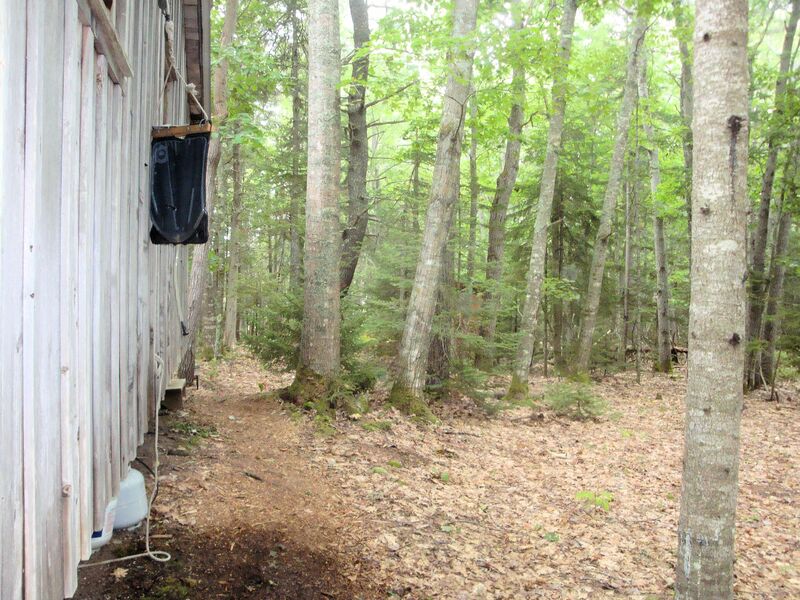 We had propane for cooking and heating water, fresh drinking water hauled in five gallon jugs, a solar boat shower which we made more comfortable with added hot water, a real bed and a commodious outhouse just a short walk away among the trees. Not bad at all. And early to bed means early to rise. With all that morning time, we had plenty of chances for exploration. 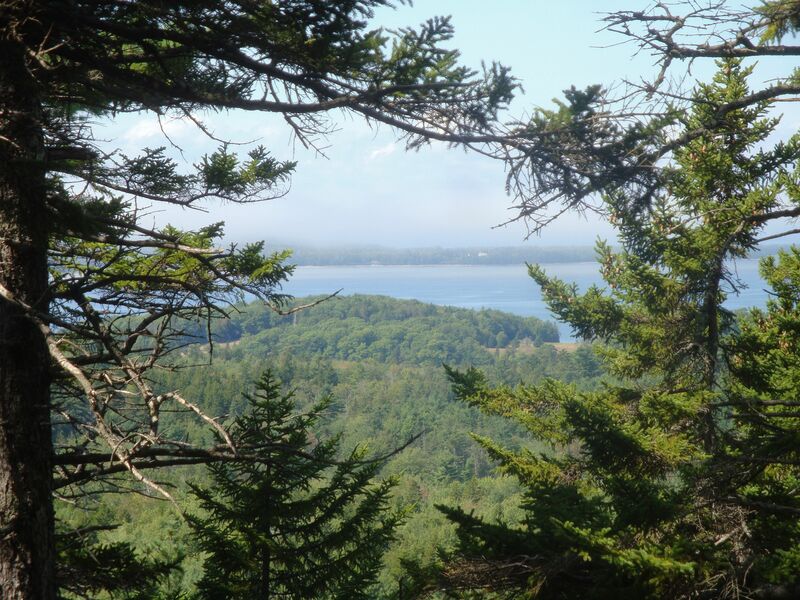 View from the top of Backwoods Mt. 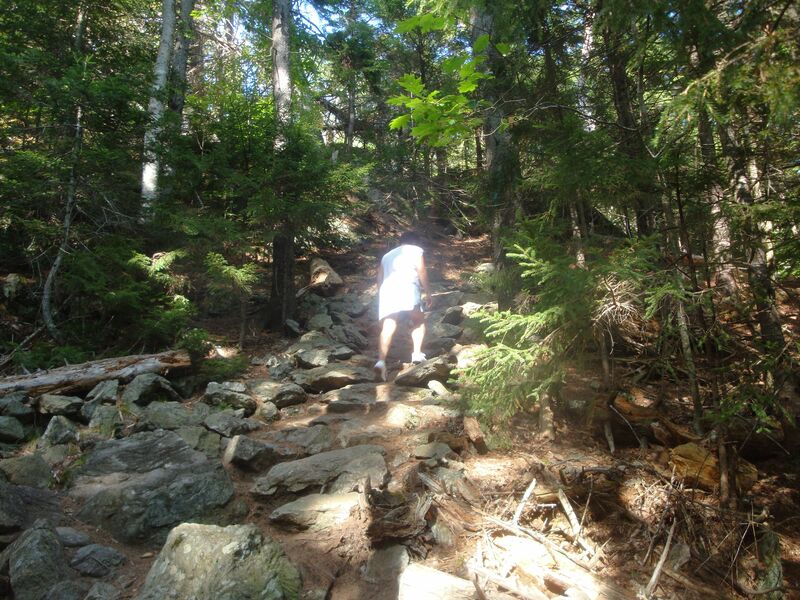 Steep trail up Backwoods Mt. 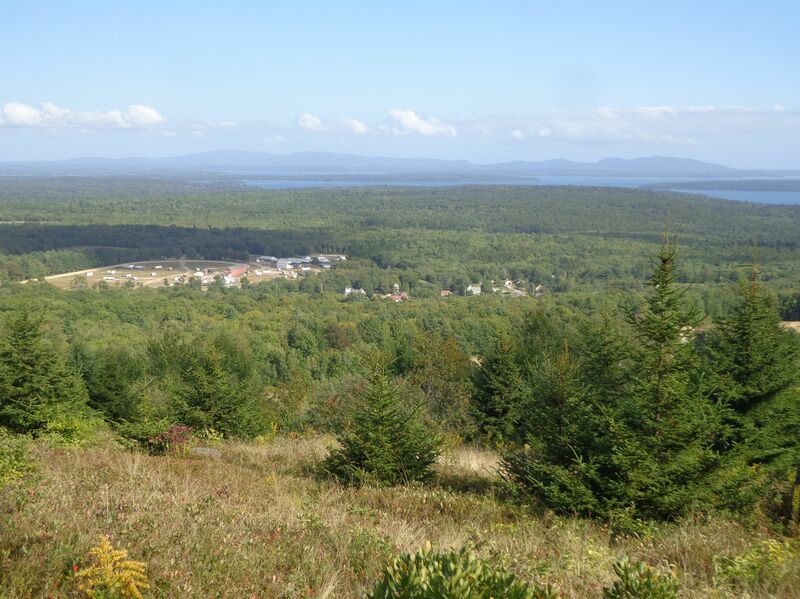 Directly across the road from the driveway to our cottage lay Holbrook Island Wildlife Sanctuary, more than 1200 acres of pristine forest, ponds, marsh, small mountains and sea shore maintained by the State of Maine. Threaded with walking trails, and featuring extinct volcano mountains for challenging climbs to gorgeous views, the Sanctuary teems with animals. We even saw a bobcat, standing right beside the road. Maybe it was the official park bobcat earning its living, who knows? We climbed Backwoods Mt, one of the old volcanoes, and spotted plenty of obsidian-like lava spit out when the site was a bubbling cauldron of molten rock. The paths were quite steep in places. This section of the Maine coast abounds in reversing falls. The phenomenon of a reversing fall occurs when the incoming tide pushes the water level higher than the body of water emptying into the ocean. The rocky stream that drops brackish water to the sea during most of the day suddenly become inundated. 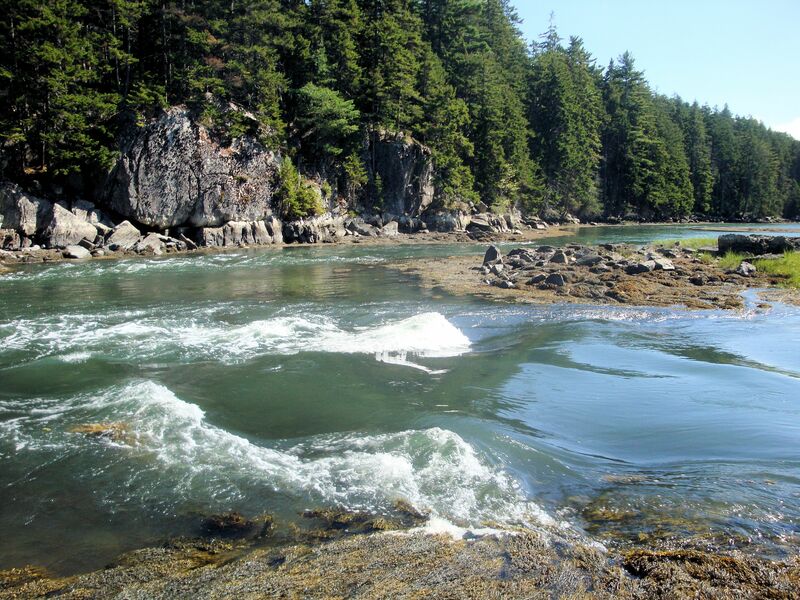 The strong flow of the tide pushing against the almost-as-strong stream creates whirlpools and standing waves. 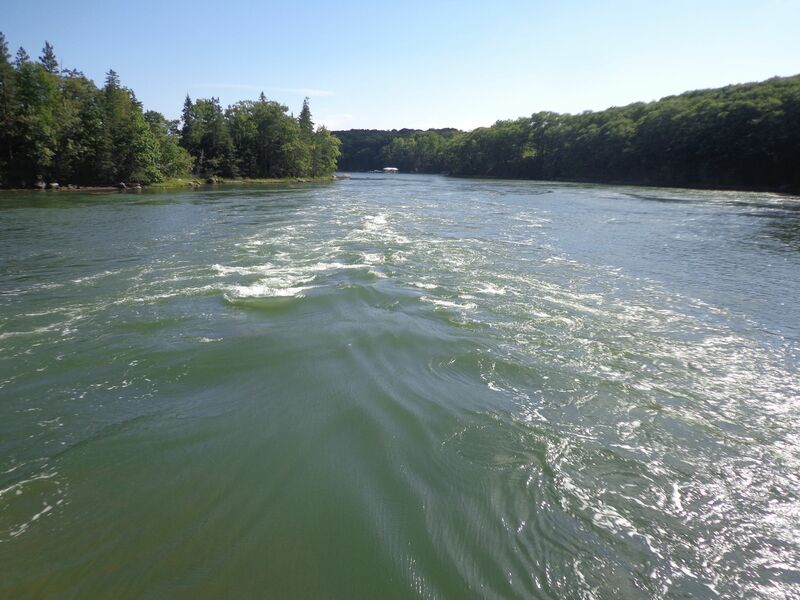 The sound of rushing water tells of the violent struggle of the currents. We watched three of the falls: Goose Falls, Bagaduce Falls and an unnamed falls on the shore near our cabin. We were able to walk to this last falls and enjoy a close-up of the tumultuous waters. We took a walk along the shore of the Sanctuary near a spot named Indian Bar. This area was once inhabited by Penobscots of the Abanaki Nation. They are gone, yet the name lingers. 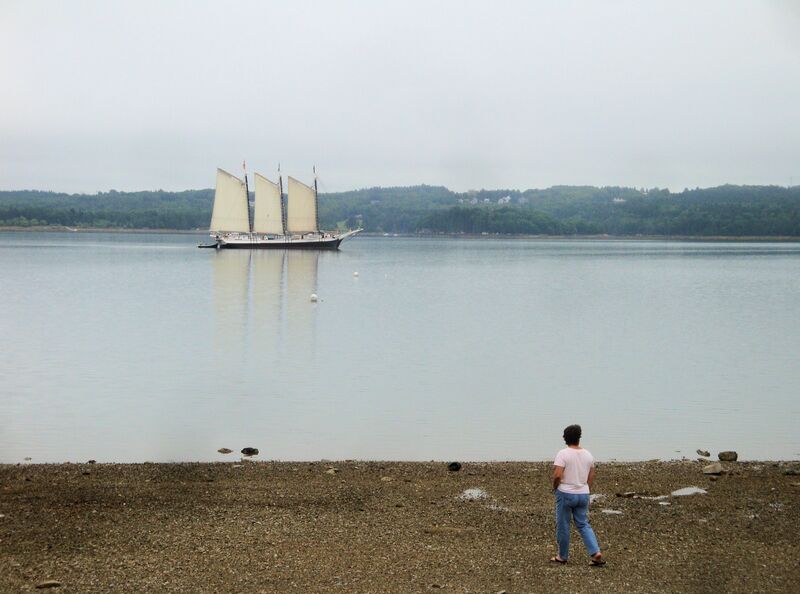 A small schooner slipped through the still waters of the harbor in the early mist. 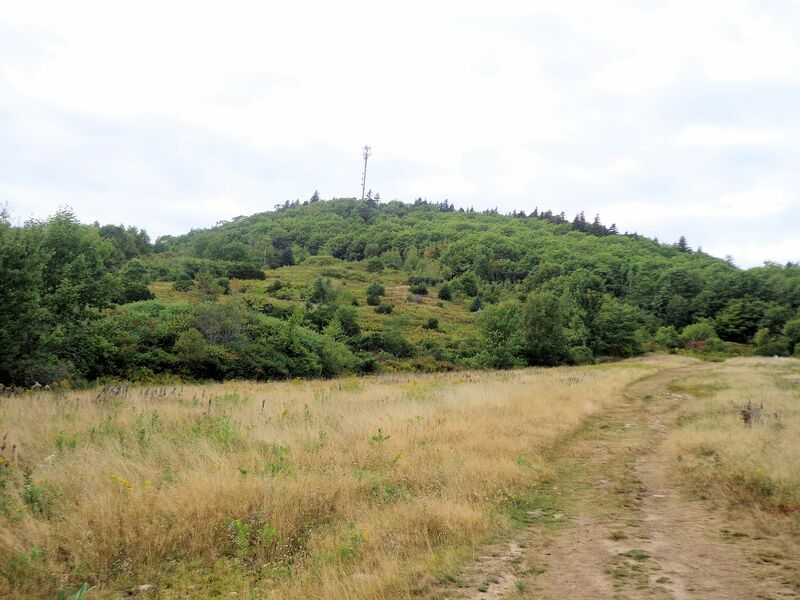 After all this fun, the climb up Blue Hill Mt might have seemed a little anti-climactic, but not at all. We saved this hike for the last day of vacation. There are several paths up the mountain. 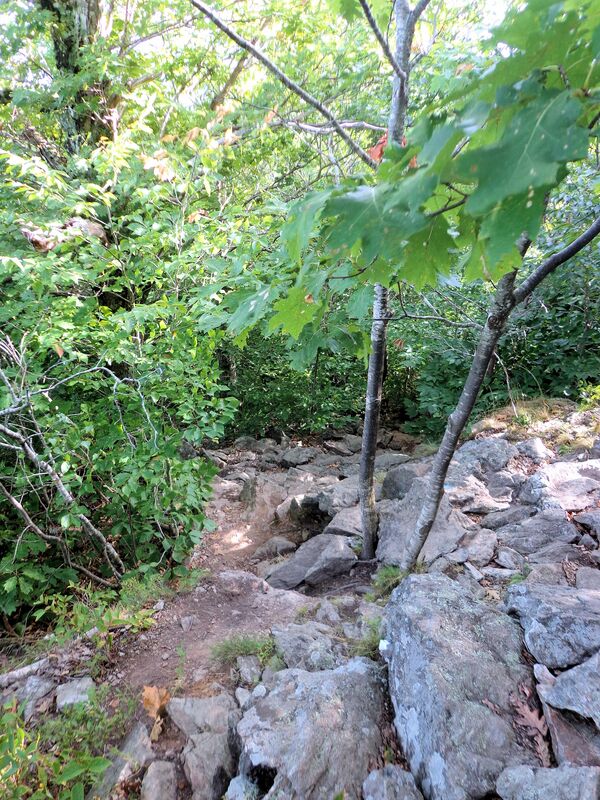 We chose a moderately difficult climb that was a shorter route than easier ways. 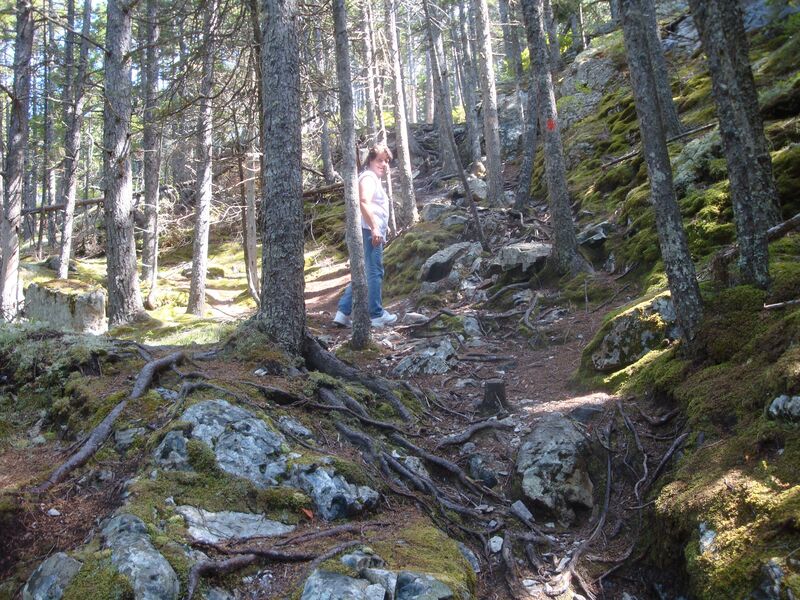 The mountain trails are maintained by a community-based trust for the enjoyment of all. A cell tower has been installed at the summit, detracting from the beauty, but helping the locals stay connected. Getting a signal in this region is challenging, even with the tower. 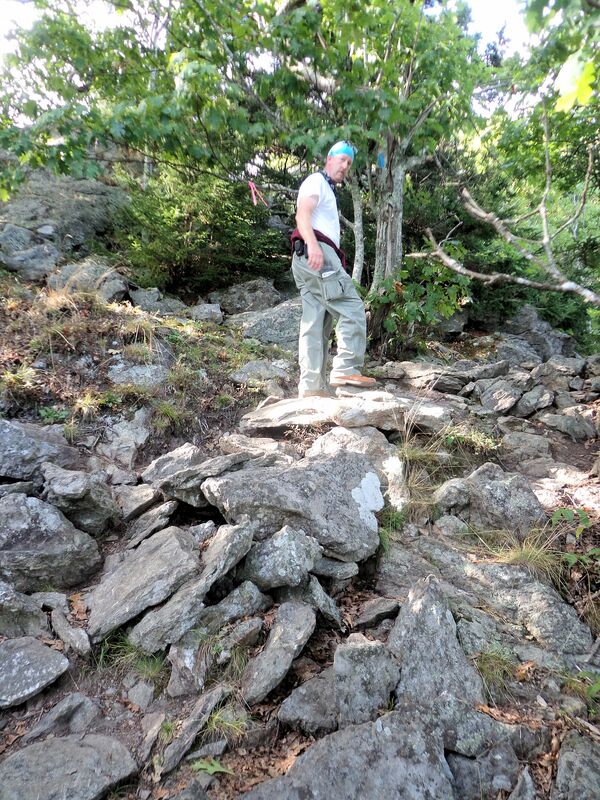 The climb was steep and littered with rocks. As we neared the top, vistas would suddenly open. 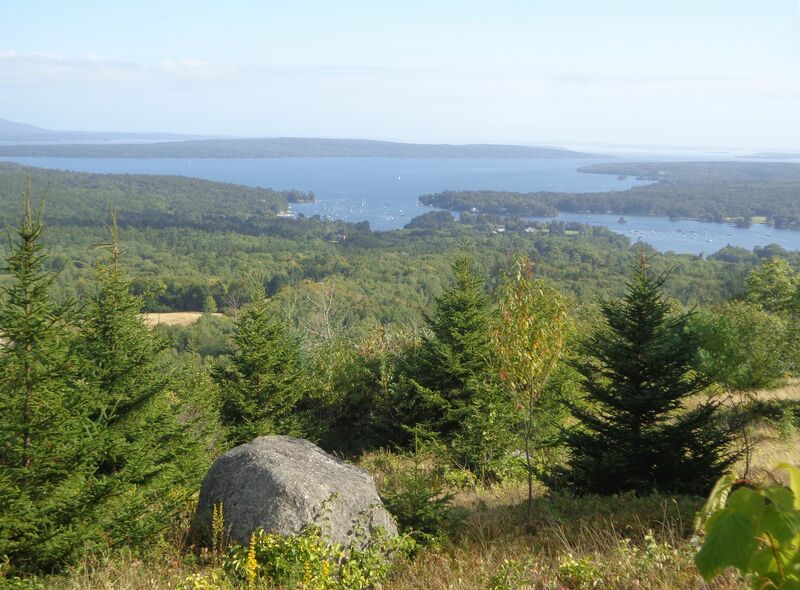 There is a nice view of Blue Hill harbor and the mountains of Acadia National Park. The Blue Hill Fair was just wrapping up for the year. The emptying fairgrounds far below brought a fleeting nostalgia for cotton candy and agricultural exhibits. 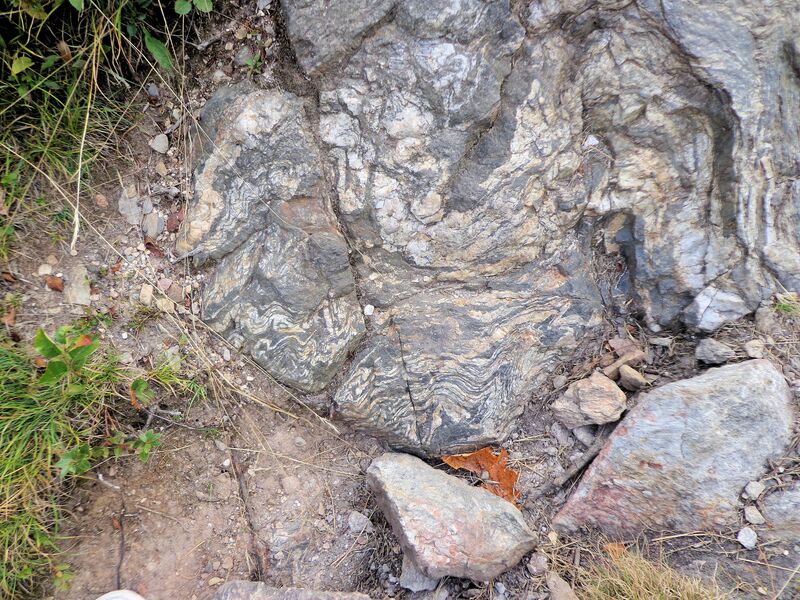 At the summit, wide sheets of bare rock reveal the geologic formation of the hill. Tortuously folded layers of seabed were turned to metamorphic rock by volcanic action as they were thrust up to form the elevation. The maintenance trail is used by technicians on ATVs to service the cell tower. It makes an easy, gradual descent for old knees. Our time in the Blue Hill region was fleeting. Going off-grid is so relaxing, once you get over the urge to check your email and social media messages. Soft candle-lit evenings, the bliss of a warm outdoor shower, enjoying a camp stove-cooked dinner eaten to the sound of crickets and night birds reminds one that the best joys in life are simple and quiet.